Kesgrave Hall is a superb Grade II listed Georgian mansion built in 1812 set in 38 acres of park and woodland. The Hall has had an interesting past that has included family home, shooting lodge, RAF and American air force base, St Edmunds School and company HQ. * Opening hours – all day! For breakfast, lunch and dinner … There’s ‘all day dining’ which means the a la carte menu is available from noon right through to 9.30 (10.00 on a Friday and Saturday night) so turn up when you’re ready, no rush ….! 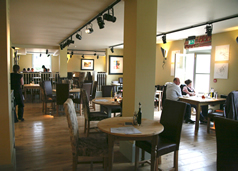 * Well behaved children will be very welcome and they’ll have their own special menu plus lots of space to run around! Where to find us – it’s easy – east of Ipswich on the B1214 in Kesgrave behind the Ipswich Park and Ride. Turn left at the main Woodbridge/Martlesham roundabout towards Ipswich. After ½ mile or so turn right into Hall Road – the entrance to Kesgrave Hall is 200 yards on your left.